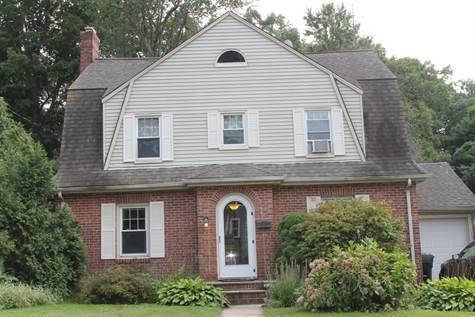 Gambrel style Colonial fresh to the market offering newer windows, & updated full bath on second floor. Oil is the fuel in the home but gas is in the home if someone wants to convert. Speaking of gas there is a gas fired range for the cook in the family! Private rear yard that contains a pergola on the patio area for relaxing evenings. Walk up attic allows for plenty of storage capabilities or the possibility of finishing off for additional living space. Unique amenities include French Doors, Arched entrance & newly refinished sun porch. Access to all highways are very short distance for commuting. Newer mechanicals include liner in chimney, damper in the fireplace, and chimney cap. Why rent when you can own with this affordable price range?